What a fantastic weekend. Two days of glorious, warm sunshine. It made me smile! This year, Mr Mac and I have a long list of jobs to do in the garden other than growing things. The problem is one job needs to be done before the next one can be started. 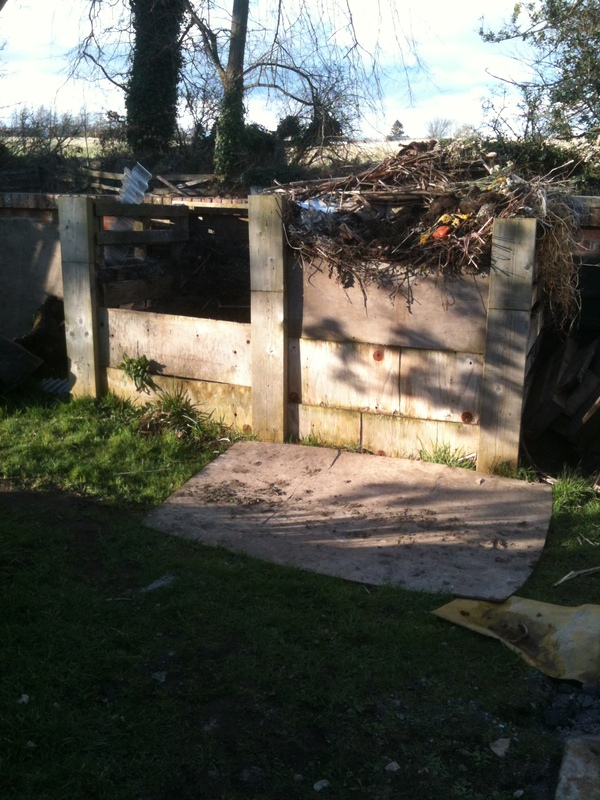 The time had come, we could put it off no longer – the compost bins had to be moved! 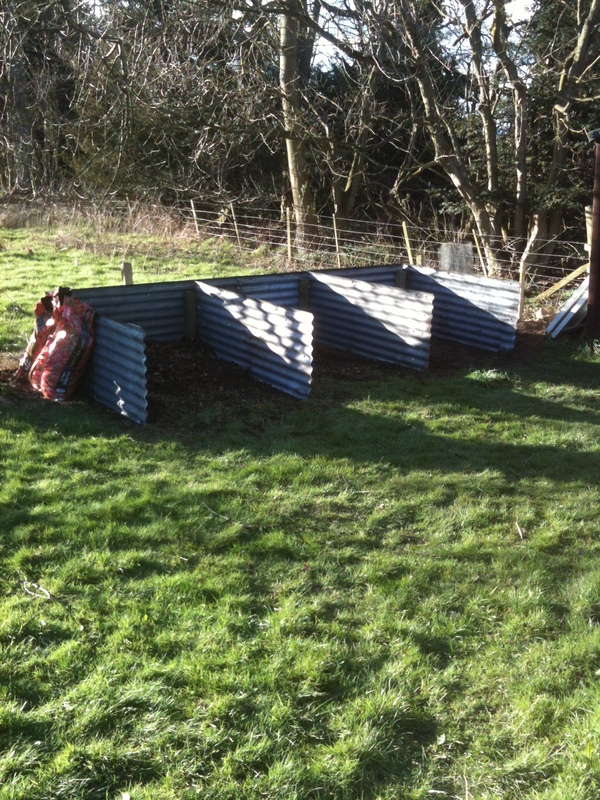 How NOT to build a compost bin! When we moved here almost 4 years ago, Mr Mac built 3 huge composting bins at the bottom of the garden. One bin had to be demolished last year to make way for the new greenhouse and the remaining 2 were just in the wrong place. As you can see from the photo they were huge and we could get loads of stuff in them. However, size is not everything! To make compost successfully it needs to be turned. This is done by mixing it up to allow the air to get in. Our bins were too high to be able to do this. We did eventually get lovely compost but it took nearly 2 years while we waited for the waste to break down. The error of our way was made clear one Friday evening courtesy of Monty Don on Gardeners World. He showed (or showed off according to an envious Mr Mac) viewers his composting “bays”. Simple compartments open at one end to allow waste to be wheelbarrowed in, tipped and left to break down. The walls of each compartment were low enough to allow the compost to be turned by moving it from one bay to the next. A few weeks later it can be moved back. The most recent waste on top is then at the bottom and plenty of air is introduced which then speeds up the process. This system should provide useable compost in as little as 3 months – a substantial improvement on 2 years! Here is the result using some old corrugated seets and some fence posts. The end bay will hold the compost that is ready to use and the other two will be used to alternate the compost that is breaking down. The walls are low enough to allow the composting waste to be lifted over with a fork into the next bay, introducing lots of air in the process. So what do we compost? To make good compost we use lots of different material. Fine waste such as grass clippings, coarse waste such as potato peelings, dry waste such as cardboard (Mr Mac highly recommends empty beer boxes for this!) and wet waste such as other garden waste. We keep one of the small plastic composting bins you buy in the supermarket under the kitchen sink and fill it with veg peelings, tea bags, coffee grinds and egg shells. A balanced mix provides the right amount of air and moisture to allow the bacteria to heat up and break down the waste. Worms also help – hence the reason Mr Mac has banned me from adding citrus peel – the worms don’t like it apparently! After a hard day in the garden I sat down to read the Sunday paper. I came across an article about an award-winning composting shed which is set to become the star of this year’s Scotland’s Garden’s Scheme (www.scotlandsgardens.org). Feeling quite smug about our newly constructed compost bays, I read on to see what the fuss was about. The garden’s owner had commissioned a firm of architects to build the £22,000, 7ft shed made of curved weathered steel and with a wildflower meadow roof. Our composting bays probably did not even cost £2 – and that was the cost of the biscuits we ate while having our tea break! This entry was posted in General and tagged compost bin, gardeners world. Bookmark the permalink. Excellent idea to use metal sheets! Ours spontaneously combusted last week and burnt down half the fence! Hmmm, you’d think a farmer would know better, wouldn’t you? Apparently not! I am taking all this on board….. the pallet was a kind of territory marking exercise just in case my significant other changed his mind about the site of the compost heaps…… an ongoing debate of several years now.